ESQUIVEL! Audiobook Wins Odyssey Honor Award | . 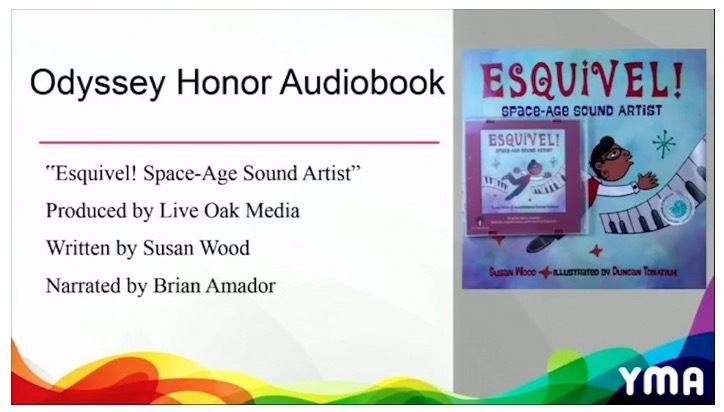 Exciting news from Seattle this morning, where the American Library Association held its Youth Media Awards, the Oscars of the children’s literature world: the audiobook of my Esquivel! Space-Age Space Artist won an Odyssey Honor Award! 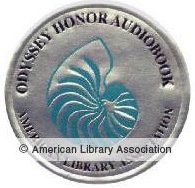 The Odyssey is bestowed for the best audiobook produced for children and/or young adults; the selection committee may also select honor titles. The Odyssey Award is jointly given and administered by the Association for Library Service to Children (ALSC) and the Young Adult Library Services Association (YALSA), divisions of ALA, and is sponsored by Booklist magazine. This year’s Odyssey Award winner is Sadie, written by Courtney Summers, and my fellow Odyssey Honor winners are Du Iz Tak, by Carson Ellis; The Parker Inheritance, by Varian Johnson; and The Poet X, by Elizabeth Acevedo. Whew—some pretty amazing company! From the award selection committee: "The work of innovative composer Juan Garcia Esquivel is uniquely portrayed in this picture book biography by Susan Wood. Brian Amador’s narration, combined with tracks of space aged music and sound effects, presents a carefully orchestrated experience, with each element of the illustrations perfectly represented in stereo sound." It’s funny, seven years ago I was an unagented writer with a quirky manuscript for kids about an obscure Mexican bandleader. In an amazing bit of serendipity that still blows my mind, the editorial director at the first house I sent it to just happened to be a vocalist with the world's only orchestra playing solely Esquivel's music (yes, really!). At the 2017 ALA YMAs, the book won a Pura Belpré Honor Award (thanks to illustrator Duncan Tonatiuh), and today, this (thanks to Live Oak Media, Brian Amador, and Rosi Amador—and they even let me voice my author's note)! It’s my little book that could. Seriously.